At Variable Media, we apply a layered approach when analyzing our data sets. When we run media online we develop natural variables that we can compare such as Monday vs. Tuesday or January vs. February or even Morning vs. Evening. Platform variables are unique in their own and understanding the vast array of these data sets helps create a multi-variable analysis opportunity. Created and defined by Variable Media, multi-variable analysis is the analytical approach taken to understanding the data from various marketing platforms and applying a humanistic methodology to evaluating and developing optimization to improve results. 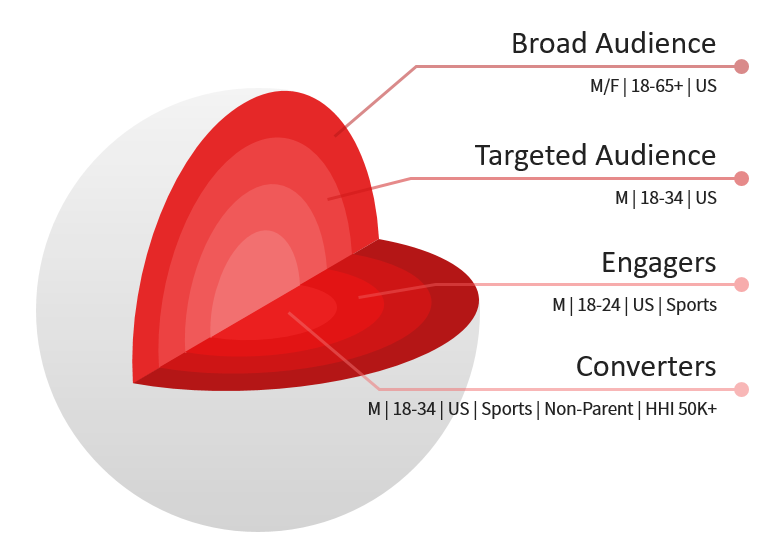 The layered audience approach above provides a visual representation of a marketers journey to a core audience. The true advantage to any marketer is the data. If we aren’t creating visual appealing data dashboards that convey a story then we are missing a huge opportunity to create valuable insight. Below you will find key advantages of multi-variable analysis. The below outlines a list of key variables we analyze at various levels of the optimization process.